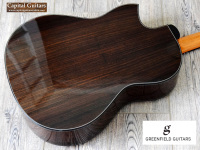 Offered here is a 2013 GF by Canadian luthier extraordinaire, Michael Greenfield. The GF is a slightly more affordable version of Michael's incredible G1 model. By simplifying the build process a bit and keeping the available options to a minimum, the relatively basic GF makes a Greenfield-built instrument a possibility for those of us who are not incredibly wealthy. Calling this a "basic" guitar, however, is absolutely absurd. 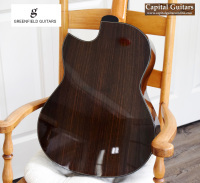 This is one of those instruments that demonstrate that while premium tone woods can make a great guitar even better, there is no substitute for exemplary design and construction. This is one magnificent instrument. 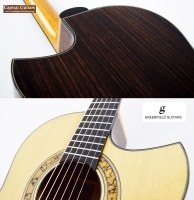 The GF is a 14-fret, grand concert guitar. 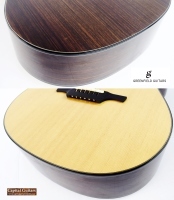 It has a 15-3/8" wide lower bout, a 25.6" string scale, a 1.75" nut width and 2.25" saddle spacing. 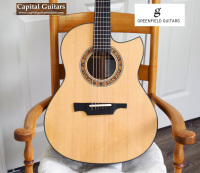 It has a flawless Sitka Spruce top and beautiful, straight grained Indian Rosewood for the back and side and this example has the optional Florentine cutaway. 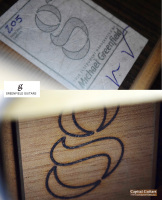 Cosmetics include Michael's own spalted Beech rosette, Ebony bindings and contrasting wood purflings. 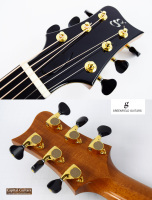 It utilizes Ebony for the fingerboard, the headstock overlay, the pinless bridge of Michael's design and the buttons of the tuners which are Greenfield 510's with 21:1 ratios. 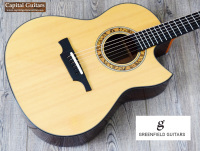 There is nothing "stripped down" about this guitar! The GF is a powerful, full-voiced instrument, but not to the extent that individual notes are overwhelmed by it's output. It has a crisp, articulate and balanced tone that is sure to please. 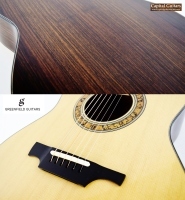 While is doesn't do this guitar justice, please check out the brief sound sample provided. I've played very few guitars that sound as rich as this GF. Michael's guitars are known to be exceptional players and this GF is no different. It plays with such ease that it seems to make you a better player. 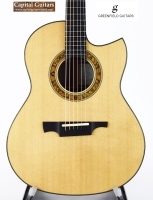 This one is currently setup with 12th fret string heights of 6/64" and 5/64" on the low and high E sides, respectively, with lots of saddle available for adjustment if desired. 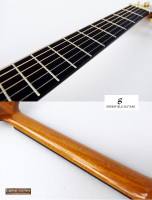 Built in 2013, this incredible piece has seen only limited play time based on it's exceptional cosmetic condition and the near flawless condition of it's frets. It shows no flaws of any significance that I can see or photograph. It comes in it's original G-logo Ameritage case, also in near mint condition. 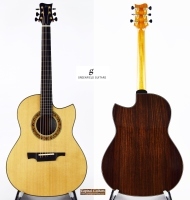 A new GF with cutaway can be had for approximately $11.5K and a considerable wait I'm told, but this near mint 2013 example can be yours for $2K less and today. 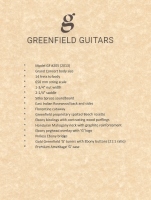 Make this "once in a lifetime" guitar yours before someone else grabs it. This really is a magnificent piece.